Zombie Math Teacher: Exponential Growth of Zombie Brain Decay & Tetrahedrons! Exponential Growth of Zombie Brain Decay & Tetrahedrons! Well folks, we have reached the end of another amazingly transformative year. My biggest regret is that life trumped my ability to blog. Although, I have switched over to "micro-blogging" on Twitter, so if you're not following me there yet, you're missing out on my more frequent (and less wordy) life/school updates. So much has happened since my last post, I hardly know where to start! Maybe working backwards is best. 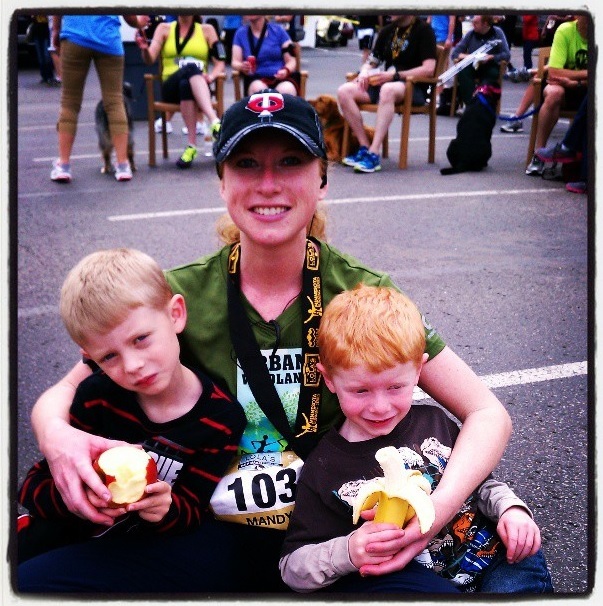 This past Saturday I ran my first half-marathon and nearly fainted. Everyone said, "It's really hilly!" and I assumed they meant just the downtown portion. I knew that, and had trained on it. Lake Waconia looks relatively flat, from a distance, but IT IS NOT. 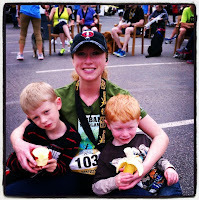 Thank goodness for the Twin Cities Orthopedics Pacer Team who kept me going with all their shouting and cheering on. I finished with a personal best of 2:01! It's laughable to look back on my first day running, almost exactly a year ago, and how much I whined about my 2-mile run being as bad as child birth. Now, here I am, running 13 miles at a 9:11 minute pace. If I can do it, anyone can do it. Really and truly. Start small and set goals. Keep a fit journal. You'll get there eventually! 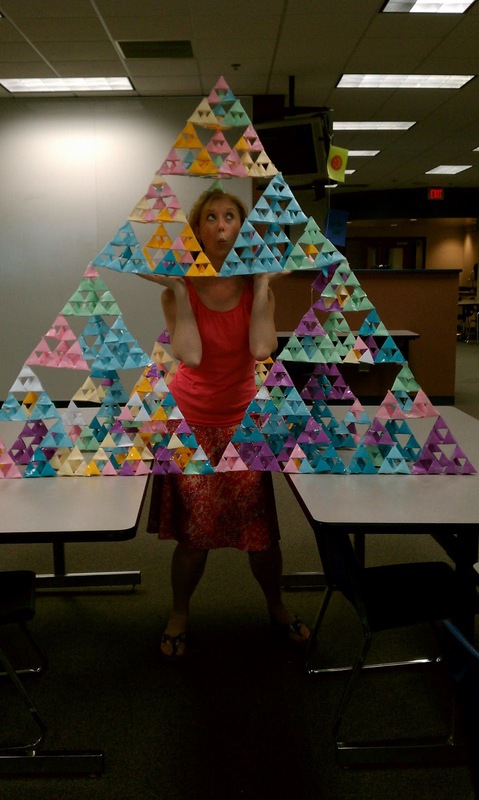 Backing up further, I am proud to say that my 7th graders this year exponentially surpassed last year's goal of a Stage 4 tetrahedron (256) and built a Stage 5 tetrahedron! 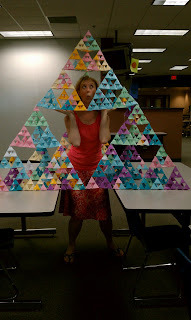 (1024 individually cut, folded, taped and glued tetrahedrons). We made individual nets that were slightly smaller than last year, knowing that the Stage 4's wouldn't fit through my classroom door otherwise. I used the Educreations app on my iPad, projected onto my Smart board, to launch the project. I took screen shots and uploaded photos to my iPad on slides in the app, and then hit the "play" button and dubbed over each slide. It took me about 4 tries to get comfortable with my own recorded voice, not say "um" every two seconds, and figure out exactly what I was trying to say. Students in four PLP's (prescribed learning periods) and one math class, took part in constructing the Stage 5. It all came together at the second to last hour of the day, on the last instructional day of the year. Talk about cutting it close! This is as big as you can go, without reinforcing the corners and connectors with some sort of Popsicle sticks. Click here for more information about the book that inspired our class, and how to get started on your own version of this interdisciplinary project. Rewinding a few more weeks, when I was still well into training for the race, and my students were hard at work on their first Stage 4, I finished my Learning Technologies Certificate from Learner's Edge. The best part of this distance learning program, is that they partner with Pacific Lutheran University. I got 12 semester credits for a fraction of the price of attending graduate classes in person. The learning was all hands-on, apply in your classroom today, and very motivating. Highly recommended! My favorite new skill is building wiki's! (like Wikipedia, except student-made) A wiki is an online site that allows registered users to interact with and add to the content. You can sign up for free at www.wikispaces.com. I found it helpful to create a student account, that anyone could use, so my students without emails could still access the program. Several students created their own wikispaces accounts, and with the tech skills they learned on the projects, can now build their own wiki sites. I also created a school Pinterest account, and a student login that could be used, both to find existing pins of slope and sequences, and to upload their work to a safe and secure account (not requiring their own email). Many students were so fascinated by Pinterest that they created their own accounts there too! Click here to see the Slope Wiki my students built in Math-7 classes. 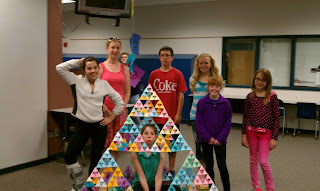 Click here to see the Sequences Wiki my students built in Accelerated Math-7. *Click the main aloe picture on the home screen for an amazingly inspiring video on the Fibonacci Sequence in nature! The last bit of big news is that I applied for, and was hired as, a Technology Integration Coordinator for Waconia Schools! I am really excited for this new role. Many of my coworkers asked, "Why would you want to leave the classroom?" My answer, was that I really don't have to leave the classroom. I get to work in all levels and types of classrooms across the district, as well as sharing instructional and pedagogical best practices with staff! It's really the best of both worlds. For me anyway. How will this affect my blog? It won't really... I've always been pretty interdisciplinary-minded, and I'm sure the math focus will still remain. You may notice that I'm posting more about learning technology, standards-based grading, and backwards design (UbD). I'm quite sure that I'll still be a zombie, and in my heart I'll always be a math teacher, even though I'll be reaching out to a wider audience. 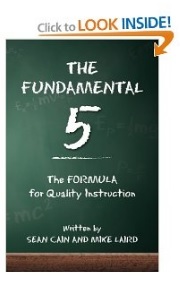 Speaking of... have you read The Fundamental 5 yet? One of my administrators recommended it for staff development and I second his high opinion of the content. It's a fantastic (and short) read. It reminds us all what we already know about best practices for instruction. If you're looking for some inspiration this summer, and/or a guide for PLC or teacher evaluation, this book is as great place to start. That's pretty much all that's new since my last posting. Teachers tend to keep their blinders on to all that is dirty/broken/unfinished around their house and in their personal lives during the school year. We have that first night of celebrating, "WAHOO! School's out!" Then we go home and open our eyes to the overwhelming mess waiting for us to clean up in just 11-12 short weeks. On top of that, many of us have summer jobs (like writing more books, hopefully?) or attending staff trainings or grad classes... or curriculum writing or teaching summer school. Anyone who says teachers "work for their summers off" is seriously deluded. My advice to anyone who is fighting the panic of their summer to-do list, like I am, is to THROW IT AWAY. Mark down on your calendar the dates/events you ABSOLUTELY have to accomplish. Let the rest happen as it will. It's a very powerful feeling to wake up in the morning, and say, "What do I want to do today?" You'll be amazed how much actually gets accomplished and you won't feel so overwhelmed. Congrats on your marathon! I need to get back into shape again. I have just been so frustrated with it lately. Thanks for the book recommendation!